Zircomet Limited will be dedicated in the product development, production and distribution of zirconium based products and offer one of the most comprehensive product ranges in the industry. The product portfolio will include reactive zirconium chemicals, pure chemical and fused zirconium oxides, stabilised zirconium oxides, zirconates and titanates. 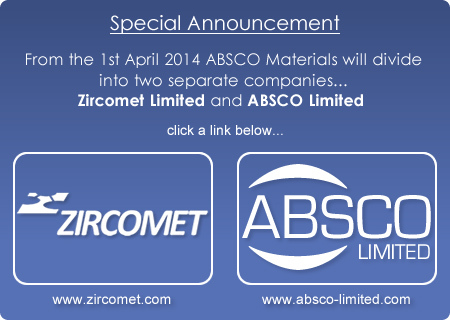 ABSCO Limited will continue to offer all other products previously supplied by ABSCO Materials including rare earth metals, oxides and compounds from Triebacher Industrie AG (UK & Ireland only), high purity metals and inorganic compounds, molybdenum compounds, boron carbide and high purity silicon.